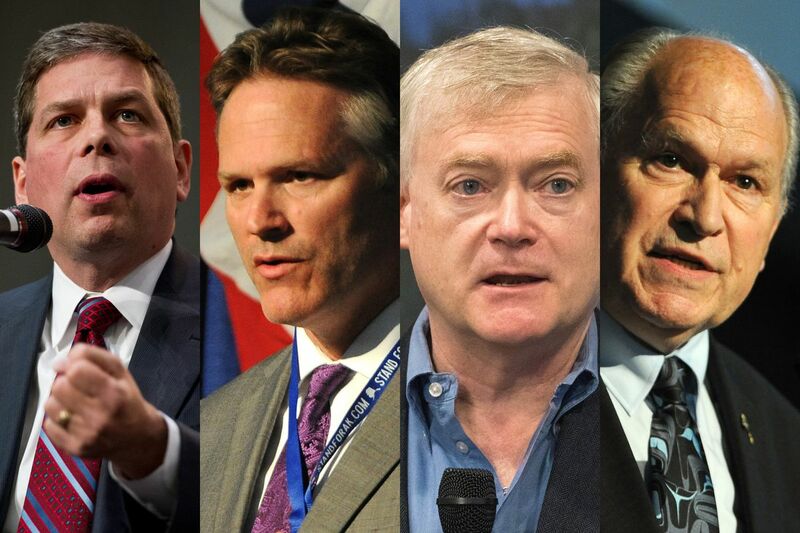 2018 candidates for governor include, from left, Mark Begich, Mike Dunleavy, Mead Treadwell and incumbent Bill Walker. New campaign finance reports show Mike Dunleavy has raised the most money among the candidates in the Republican primary for governor — one of the most closely watched races in the upcoming Aug. 21 election. The race pits Dunleavy, a former educator and legislator from Wasilla, against Mead Treadwell, a former lieutenant governor who lives in Anchorage. There are five other candidates in the Republican primary for governor, though they have raised no money or little money compared to the two front-runners. Money raised by campaigns buys staff salaries, advertisements, signs, fliers, buttons and more, said Ivan Moore, a longtime Alaska pollster who has done work for Democratic candidate Mark Begich and Gov. Bill Walker, the incumbent. Having more money helps candidates get their message in front of voters but doesn't always translate to a win, Moore said. "Does it mean it's a slam dunk? No." Checks written to the candidates are only part of the campaign finance picture. Independent expenditure groups, formed to boost or oppose candidates, can collect unlimited donations from individuals and corporations under a legal framework set out in the 2010 Citizens United ruling by the U.S. Supreme Court. The groups, however, are barred from coordinating with a candidate's campaign. This year, big money is flowing into the primary election from an independent expenditure group formed in support of Dunleavy's campaign. By Aug. 11, that group, Dunleavy for Alaska, had raised about $744,000 and spent all but about $15,560, according to an APOC report filed Tuesday. Most of that money — more than $500,000 — was from donations by two people: Dunleavy's brother, Francis, who lives in Texas, and Bob Penney, a developer and sportfishing advocate in Alaska. An independent expenditure group that formed in opposition to Dunleavy had raised $26,000 from three donors with out-of-state addresses. It had incurred about $65,000 in debts. Meanwhile, an independent expenditure group formed in support of Treadwell's candidacy had raised $53,550 by Aug. 11 and spent about $41,800 of that total. Yet another independent expenditure group surfaced Wednesday: Unite Alaska, formed in support of the re-election of Gov. Bill Walker and Lt. Gov. Byron Mallott. Unite Alaska is co-chaired by Barbara Donatelli, senior vice president at Cook Inlet Region Inc., and Jim Sampson, former Fairbanks borough mayor and founder of the Fairbanks Pipeline Training Center, according to a news release from the group. Walker has opted to bypass the primary election, instead collecting signatures to appear on the general-election ballot as an independent. Begich, a former U.S. senator, is running unopposed in the Democratic primary. A three-way race for governor is expected in November's general election between Walker, Begich and the Republican who prevails in the upcoming primary. Here's a closer look at gubernatorial candidates' seven-day campaign finance reports filed with APOC on Tuesday. Mark Begich: Begich raised $41,246 between July 21 and Aug. 11, bringing his fundraising total to $174,619. Begich jumped into the race for governor at the last minute, on June 1. His more recent donations include $1,000 from the Anchorage electrical workers union, International Brotherhood of Electrical Workers Local 1547, and $500 from Anchorage Assemblyman Eric Croft. 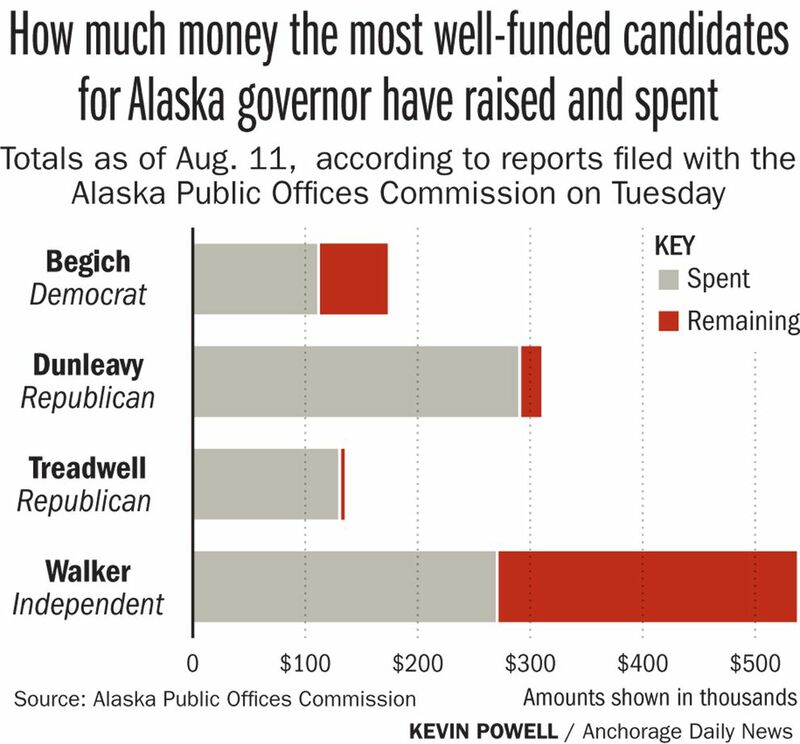 Begich had spent $111,850 by Aug. 11. He still had $62,769 cash on hand. Mike Dunleavy: Between July 21 and Aug. 11, Dunleavy raised $42,598 — the most of any gubernatorial campaign during that period — bringing his fundraising total to $311,330 over the campaigning season. Dunleavy has been in the running for governor since last year. His more recent donations include $500 from Tom Collier, chief executive of the Pebble Limited Partnership, and $500 from Joseph Usibelli of Usibelli Coal Mine in Healy. By Aug. 11, Dunleavy had spent $290,676. His campaign had $20,654 cash on hand during the final push to the primary. Mead Treadwell: Treadwell raised $23,349 between July 21 and Aug. 11. Treadwell was also a last-minute entry into the governor's race on June 1. He had raised $136,312 total by Aug. 11, spending $130,595 and with $5,716 left over. Treadwell's more recent donations include $500 from Diane Bachman, owner of Alaska Energy Services in Anchorage, and $500 from Charlie Grimm, chief executive of BAC Transport in Anchorage. Bill Walker: In the three weeks leading up to Aug. 11, Walker, the incumbent, raised $40,983, bringing his fundraising total during this campaign cycle to $538,353. He had also brought forward tens of thousands of dollars from his 2014 campaign. Walker's more recent donations include $500 from Keith Meyer, president of the Alaska Gasline Development Corp., and $1,000 from the Carpenters Union Local 1281. Walker had spent $270,587 by Aug. 11, according to the APOC report filed Tuesday. He had $317,706 cash on hand — the most of any candidate for governor. Michael Sheldon: Sheldon, a Republican who lives in Petersburg, raised a total of $2,538 during his campaign but spent $9,616, putting him several thousand dollars in the red. Sheldon has spent the bulk of his money on travel for campaigning and debates, according to APOC reports. Gerald Heikes: Heikes, of Palmer, is also running in the Republican primary for governor. He has raised a total of $300 and spent $260. That money came from a single donor in December. Other Republicans: Republican primary candidates Darin Colbry, Thomas Gordon and Merica Hlatcu have not reported raising any money. William "Billy" Toien: Toien, of Anchorage, is a Libertarian candidate for governor. He has raised a total of $685 and spent $976, also putting him in the red. The fundraising tallies are continuously changing. Until the primary election, candidates and groups must file a new report with APOC every time they raise more than $250 from one source. The primary election is Tuesday, Aug. 21. Polls will be open from 7 a.m. to 8 p.m. Find your polling place here.